A large beacon which flashes every fifteen seconds, sits atop the red and white lighthouse in St. Anthony Harbour at Fishing Point Park in Newfoundland, Canada. A Canada flag blows in the breeze which water vessels can see as they pass by the harbour making their way around the icebergs which have made their journey to Newfoundland. The lighthouse is now fully automated, but at one time a lighthouse keeper was in charge of the working operation of the lighthouse where a permanent house was built nearby in 1955. Today, visitors to St. Anthony, can tour through the lighthouse and learn of its history as they enjoy the beautiful scenery surrounding the area. St Anthony Lighthouse at Fishing Point Park at the entrance to the St Anthony Harbour, St Anthony, Viking Trail, Northern Peninsula, Great Northern Peninsula, Newfoundland, Canada. 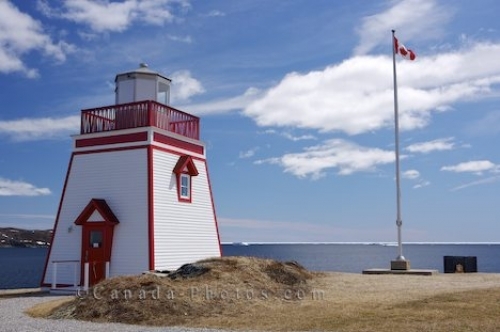 Picture of the St. Anthony Lighthouse in Newfoundland, Canada and the harbour scenery where icebergs pass by.